Let’s try a combination brought to us by Indian cuisine, who are masters of everything vegetarian. The dish is called Saag. We talk about low carbohydrate diets and what is good for diabetics and weight loss and this dish is one of the them. I think part of our eating should include a vegetarian dish or meal frequently through the week. I have been making this dish for years and it features spinach and a southeast Asian low sodium, lower lactose cheese called paneer. For those that are mildly lactose intolerant, paneer can be digested more easily. One ounce of cheese is 90 kcals. At 5 grams of sodium per one ounce of paneer, the Saag is a low sodium, high protein, low carbohydrate dish! The cheese is made with whole milk and is a fresh not fermented cheese, so no tyramine here to cause migraine headaches. I have been a fan of Indian food for a long time and their spice combinations add so much depth to vegetables and meat, that you would not miss the salt. Too spicy for you? Cut back on chilis or delete them from the recipe all together. The spice, turmeric, a key component to the dish, considered an anti inflammatory in Ayurvedic medicine, alleviates osteoarthritis in the knee and other conditions. Spinach at one cup cooked, has 59% of dietary value for Vitamin A and 25% for Vitamin C. Spinach provides a high amount of Vitamin K at 442 mcg per 1/2 cup to aid in our clotting abilities. Note: Patients should consult with their physician when taking Warfarin, due to the high content of Vitamin K per serving of spinach , which may conflict with the medication. Trim stems off the spinach and set aside. Cube the paneer and place in a mixing bowl with one teaspoon of oil, all the dried and fresh spices, salt, pepper and paneer and coat the cubes. Let sit for 10 minutes. Add one teaspoon of oil to a frying pan, turn to moderate heat for 30 seconds, add the chopped onion and saute until onions are slightly golden. 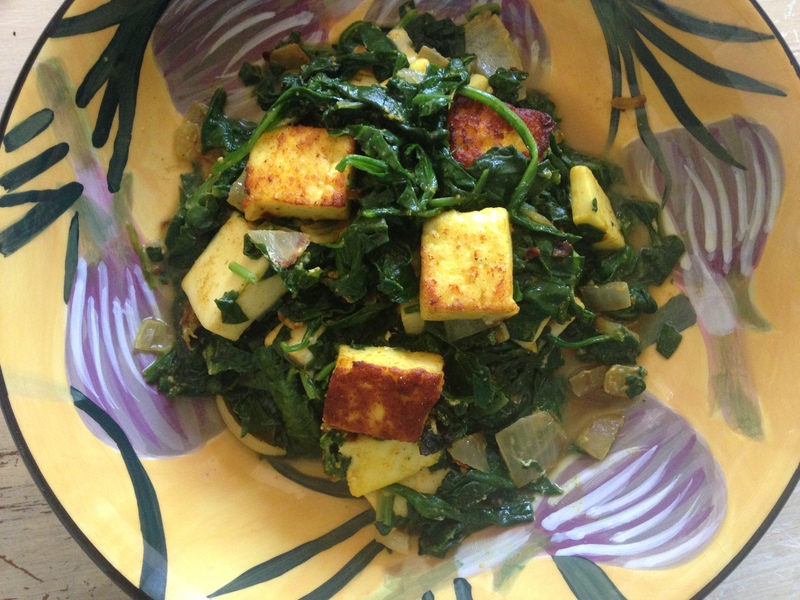 Add the paneer to brown on all sides and combine with the spinach and cook until wilted. If dry, add the water to moisten and stir. Take pan off the heat. Serve chopped cilantro and rice if desired. yields: 4 side servings.